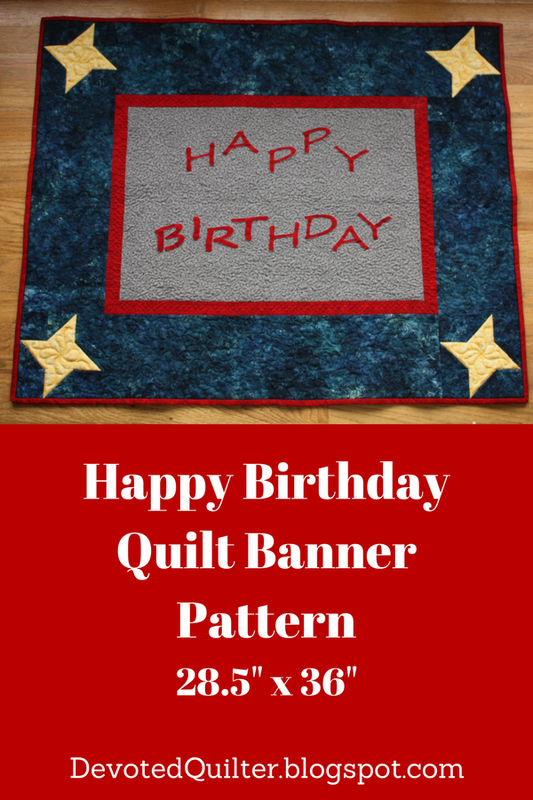 I have finished the Happy Birthday banner quilt! Actually, I finished it a few weeks ago, but kept it in reserve in case I didn't meet my own goal of having my And Sew On quilt finished for when I hosted TGIFF last week. I wanted to have a finish for my own finish linky party, after all! But And Sew On was finished in time for the party, so today Happy Birthday get its moment to shine. This was such a fun quilt to put together. I used EQ7 to design it, learning how to write on a quilt in the process. The piecing and applique are both very simple, but I was worried about stitching around the letters because they're a little thin. I shouldn't have worried though, they're just thick enough to make it easy to go around them with a small zig zig stitch. I love how the quilting shows up on the solid sheet I used for the back. I used grey thread for a tight stipple in the center of the quilt, which really highlighted the letters. Then a red thread for a wishbone design in the red border, followed by blue thread for a meandering star in the blue border. Of course, the design in the friendship stars is my favourite part of the whole quilt! This picture was taken before I put on the binding. This is my last eligible finish for the FAL this quarter. I guess three out of the five on my list isn't too bad a showing. I have written the pattern for this quilt, which will soon be in my Craftsy Pattern Store. *Edited to say I no longer sell my patterns on Craftsy because of the VAT, so the pattern is actually available in my Etsy and Payhip shops. ...until she ran into a problem. Those border pieces are too small, and no, it wasn't her mistake. This is why pattern testers are so important! I had written for the pieces to be cut 1/2" narrower than they needed to be, which obviously doesn't work. Rest assured, the mistake has been fixed, so the pattern that will be available in my store has the correct measurements. Get your copy of the pattern from my Etsy or Payhip shops! Amanda Jean is back from her blogging hiatus, so I'll be linking with Finish it up Friday, TGIFF, Can I Get a Whoop Whoop? What a great story! I'm so glad you had something so fun to hold in reserve, just in case, but I'm glad you got your special big finish done on time because that still really is so cool. Congratulations on adding another pattern to your store. Your pattern tester did you proud! What cute quilts! I especially love the little star quilting.